Calms irritated skin thanks to the antibacterial and protective effects of silver. Highly effective microsilver calms irritated skin thanks to its antibacterial and protective effects. Particularly suitable for sensitive skin prone to inflammation such as rosacea. 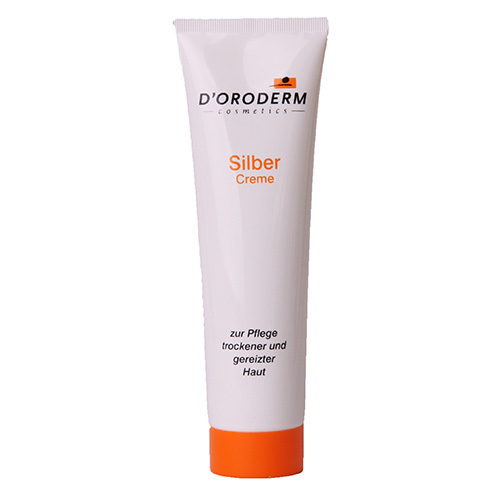 This silver creme can be applied anywhere where the skin is red or irritated (e.g. after shaving). Absorbs quickly and leaves no greasy film. Use once or twice a day by applying generous amounts to the affected areas. Ingredients: Aqua (Water), Glycerin, Cetearyl Alcohol, PEG-8, Ethylhexyl Stearate, Stearic Acid, Palmitic Acid, Cyclopentasiloxane, Panthenol, Dimethiconol, PEG-75 Lanolin, Sodium Hydroxide, Parfum (Fragrance), Methylparaben, Propylparaben, Silver (CI 77820).